Featured on NPR's 2017 Summer Reading List! Seen on Turner Classic Movies' Noir Alley! Nominated for the Agatha, Anthony, Left Coast Crime, and Macavity Awards! "A champagne-flavored frolic of a first mystery ... sure to delight fans of old Hollywood and Turner Classic Movies." "Set in 1937, Patrick’s upbeat, name-dropping debut starring real-life Hollywood costume designer Edith Head puts feminine cleverness, fashion sense, and social acumen front and center ... create(s) both a complex environment for sleuthing replete with possibilities and an exciting sense of the glamorous, gossipy, and creative world of cinema’s golden age. The warm working relationship that develops between Lillian and Edith will leave readers eager to see more of their adventures." "A sparkling debut performance ... For readers who love Hollywood, high fashion, strong women and witty dialogue, Design for Dying is a thoroughly entertaining first act." "As effervescent as champagne and as charming as Myrna Loy, Design for Dying is an enchanting debut that promises fun and adventure in vintage Hollywood ... Here’s hoping this is the first in a long-lived series." 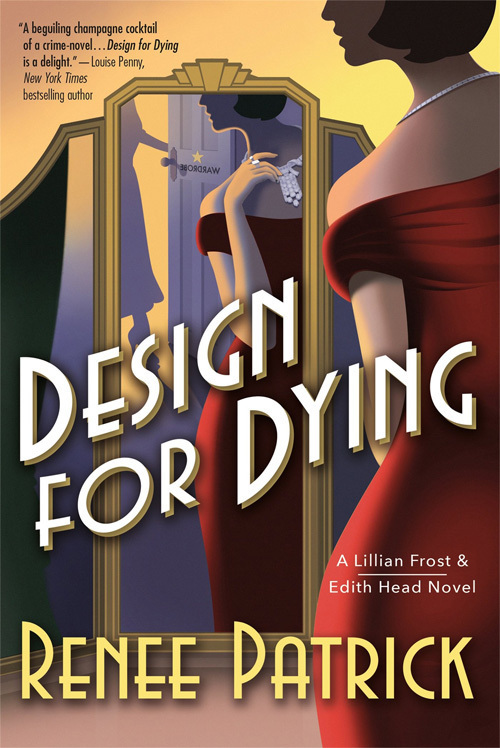 "In this first of a planned Lillian Frost & Edith Head series, readers will be swept away on a murder mystery set in Hollywood’s Golden Era ... Design for Dying is well designed indeed ... Fans of Hollywood noir films, the Poirot series, and other cozy mysteries will want to read Design for Dying as will anyone with a love of historical characters brought to life." "This delightful novel of Old Hollywood is as heady and beguiling as the champagne that flows freely at the parties that litter its pages ... but also as satisfying as a hearty, if perhaps somewhat decadent, meal. As the first in a series, it definitely whets the appetite for more." "It is the series characters, Lillian Frost and Edith Head, who really shine here. Too, the narrative, dialog, and setting are all pitch perfect, taking the reader back to late 1930s Hollywood and making them feel part of the story. It's remarkably well done." New and Notable Film Books Monthly Pick ... "a breezy crime novel." Crime Fiction Pick of the Month ... "a charming and gossipy tale." "Patrick captures the glory and absurdity of Golden Age Tinseltown while simultaneously weaving a very entertaining mystery." "A thrilling debut mystery ... as carefully designed as one of Head’s Oscar-winning creations." "4 stars ... a fun read that manages to hilariously blend fiction with real people." "Great fun ... the first book in what’s going to be a terrific series ... just a delight, a lovely mystery." "Plucky protagonist Lillian Frost joins forces with pragmatic, witty Edith Head to help solve the murder of beauty queen Ruby Carroll, found in an alley wearing a costume thieved from Paramount's wardrobe department. Add a flamboyant Argentinian lothario, whose family made its fortune mining emeralds, an enigmatic Hungarian princess on-the-lam, and an elegant Burmese cat called Miss Sarah Bernhardt and you'll begin to understand why this champagne-cocktail-of-a-crime-novel is so beguiling. Supporting parts played by Barbara Stanwyck and Preston Sturges will make every seasoned cinephile swoon. Design for Dying is a delight." "Renee Patrick’s Design for Dying is a delightful cocktail of a mystery — equal parts sweet, tart, and effervescent.... Details like appearances by Gracie Allen, Bob Hope and behind-the-scenes glimpses of the movie studios (as well as more noir parts of Los Angeles) ensure a read covered in movie magic stardust." "Design for Dying reads like a dream, one in which classic Hollywood does a dance with old-school crime fiction. It's spiced with famous faces and features a beguiling newcomer, Lillian Frost, who's destined to be a star in her own right. They don't make 'em like this anymore—so it's a good thing Renee Patrick is here to write 'em." "Vibrant, stylish and crackling, Design for Dying is both a gift to devotees of Golden Age Hollywood and a mystery-lover’s delight. With two smart, resourceful heroines and starry cameos around every corner, it’s a delicious cocktail, one you won’t want to end." "Cue the applause! This stylish and cinematic take on vintage Hollywood will delight movie buffs – and mystery-lovers – with its star-studded cast and clever whodunnit. Straight from the silver-screen, it's smart, authentic, and irresistible." "Scandal, intrigue, and clothing descriptions to die for abound as salesgirl Lillian Frost joins forces with legendary Hollywood costume designer Edith Head in this sparkling debut. If you love historical mysteries crackling with wit and seamlessly interlaced with period detail, you’ll want to try Design for Dying on for size; it’s guaranteed to be a perfect fit." "Design for Dying is a sparkling cocktail of classic mystery, clever writing, and the chance to mingle with the stars of Golden Age Hollywood. Call me a fan; I’ll gladly follow Lillian Frost behind the scenes at Paramount Pictures any time she asks! I recommend you open this book, settle back comfortably in your seat, and prepare to be thoroughly entertained." "Paced like a gunshot and sheer fun to read, Design for Dying delivers on its ingenious premise – Edith Head as amateur sleuth – and then some. While providing a knowing look behind the scenes of fashion in film during the heyday of the Hollywood studio system, it also turns an unsparing eye on the dark underbelly of pre-war Los Angeles – while never losing its sly, wisecracking sense of humor. A smart, wicked gem of a book." "Plenty of glitz and glamour, snappy patter, clothes talk, and in-jokes. Design for Dying is a delightful book ... Lillian Frost is a wonderful first-person narrator, and Edith Head is an excellent semi-armchair detective. It's one not to miss."